What is Advanced Supply Chain Software? 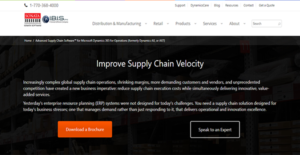 Advanced Supply Chain Software is a Gold Microsoft Partner that gives you a comprehensive batch of tools for managing your supply chain via Microsoft Dynamics 365. You can rest assured that these features work seamlessly and allow you to streamline your operations as people who are experts in their industries design the software. Advanced Supply Chain Software is also an integrated solution. It combines back-office, customer facing, and analytics in a single platform to give you answers you need to address business your specific business challenges. Furthermore, Advanced Supply Chain Software helps you look into the future with forecasting algorithms. When you use them for insights, you can better prepare your business to face potential issues and challenges and gain an edge over your competition in the process. Sales and manufacturing each have their constraints that can potentially restrict your growth. Advanced Supply Chain Software lets you compare your goals with your limitations and helps you find ways to increase your margins. That is because it supports your business goals and it facilitates active management of processes so you can focus on them when you need to. It is every business’s aim to have a healthy revenue. However, there are challenges that limit the achievement of that goal. Fortunately, Advanced Supply Chain Software assists you in optimizing prices to make them more attractive to your customers and to potential clientele. Once you get them on board, you can start improving your bottom line. Advanced Supply Chain Software offers you an inventory management system that works the way you do. With the right organization tool, you can optimize your stocks and have complete visibility of your items’ numbers. As such, you always know when is the right time for you to order more units of a product to meet demand efficiently. You need real-time data to help you make the soundest decisions on the spot. That is why Advanced Supply Chain Software provides you with insights when you need them. Thus, you can drive your business forward swiftly and effectively. If you are considering Advanced Supply Chain Software it could also be sensible to analyze other subcategories of Best Distribution Software collected in our base of B2B software reviews. It is crucial to note that hardly any software in the Distribution Software category is a perfect solution that can fulfill all the goals of all business types, sizes and industries. It may be a good idea to read a few Advanced Supply Chain Software reviews first as some solutions may excel exclusively in a very narrow group of applications or be created with a really specific industry in mind. Others might work with an idea of being easy and intuitive and therefore lack complicated elements needed by more experienced users. There are also services that support a wide group of customers and provide a rich feature base, however that frequently comes at a more significant price of such a service. Ensure you're aware of your needs so that you purchase a service that offers exactly the features you search for. How Much Does Advanced Supply Chain Software Cost? Advanced Supply Chain Software is a supply chain-focused ERP software. If you are interested in implementing it in your organization, you can request enterprise pricing by phone, email, or contact form. We realize that when you make a decision to buy Distribution Software it’s important not only to see how experts evaluate it in their reviews, but also to find out if the real people and companies that buy it are actually satisfied with the product. That’s why we’ve created our behavior-based Customer Satisfaction Algorithm™ that gathers customer reviews, comments and Advanced Supply Chain Software reviews across a wide range of social media sites. The data is then presented in an easy to digest form showing how many people had positive and negative experience with Advanced Supply Chain Software. With that information at hand you should be equipped to make an informed buying decision that you won’t regret. What are Advanced Supply Chain Software pricing details? What integrations are available for Advanced Supply Chain Software? If you need more information about Advanced Supply Chain Software or you simply have a question let us know what you need and we’ll forward your request directly to the vendor.